« SO WHAT ABOUT THE ’60s? An Oaklander with a thing for Paris? That would be me, of course. But in this San Francisco Stein summer – with major exhibits, readings, performances, in addition to her appearance in the new novel about Hemingway, The Paris Wife by Paula McLain, and Kathy Bates’ rendering in Woody Allen’s magical Midnight in Paris — my small light has been rather subsumed by Gertrude Stein, Superstar. 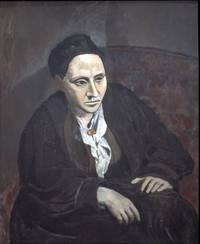 Although we both started out elsewhere – she in Pittsburgh, I in Pasadena – and she left Oakland early, while I landed here late, I’m fascinated by the Franco-California crosscurrents she fanned and the role the Stein family played in bringing modern French art, and a French sensibility, to the Bay Area. The world she left and the one she entered when she visited her brother Leo in Paris in 1902 — only to decamp there permanently – seem very distant. Yet they are not hard to imagine, thanks in large part to all the documentation she left behind. Of course the self-proclaimed genius made her mark as stream-of-consciousness “ a rose is a rose is a rose” kind of writer with a pronounced antipathy to commas. But she was as famous for becoming an icon of the avant-garde that she helped promote and create with her art collecting, her salons, her famous friendships and quarrels. Soon after her arrival, she and Leo began collecting, and promoting, the works of Matisse, Renoir, Cézanne, Toulouse-Lautrec, Picasso and many other great contemporary artists, whose works hung on the walls of their Left Bank apartment, 27 Rue de Fleuris, where “salons” were held so the work could be viewed by an invited public, rather like an exclusive museum. That “museum” was revisited, and then some, by two simultaneous San Francisco exhibits this summer, one at the Contemporary Jewish Museum, dedicated to telling the story of Gertrude’s life using stories, photos and memorabilia, and a large collection of paintings originally owned by the Stein family at SFMOMA. 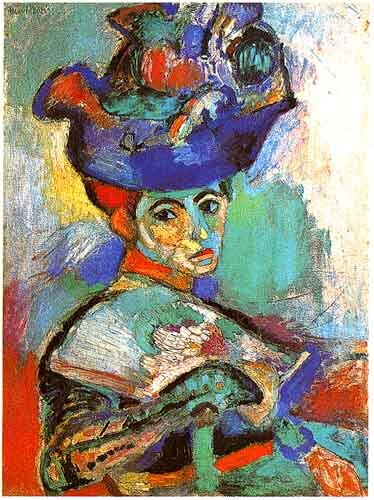 and Matisse’s 1905 Woman with a Hat. It was the latter, curiously that caused a furor, and certainly more public controversy than Gertrude’s outsized life. Think modern art, experimental literature, lesbianism, marijuana use, theatrical dress, bohemian Left Bank Paris. But the painting, with it’s green face and unnatural colors was considered an outrage. The two paintings also symbolize the rift between siblings Leo and Gertrude that led to a permanent split in 1914. 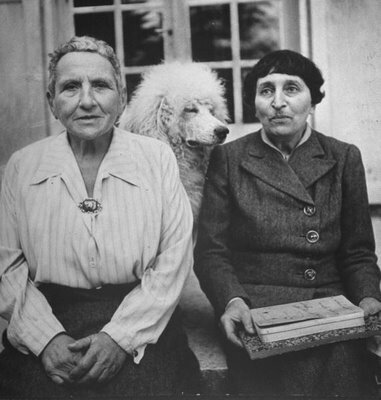 It is said that problems began with Gertrude’s lifelong partnership with Alice B. Toklas, which commenced in 1911; or that because Leo also considered himself a genius, one apartment eventually couldn’t contain two such egos. But it is undeniable that the two disagreed more and more about art. Leo made off with most of the Matisse’s, and Gertrude, who embraced Cubism, kept the Picassos. Their brother Michael and his wife Sarah collected, too, and they eventually returned from Paris to Palo Alto, where they showed many of their Matisse’s – the first to be seen in California – and other family works. Eventually, their collection, including The Woman with the Hat, became the core of the San Francisco Museum of Modern Art. My grandfather was born not far away in East Oakland in 1882. The old family home is now a Vietnamese grocery. I, at least, know exactly what she meant. I appreciate your kind words and hope you continue to enjoy the French flavor here. More to come next year, when I am again in France. Thank you Vancouver, and I hope you enjoy strolling through things with a French twist, as I do.